Nestled at the base of majestic Pikes Peak - the historic mountain that inspired Katharine Lee Bates to write "America the Beautiful" - Colorado Springs and its surrounding area offer an endless number of thrilling activities. 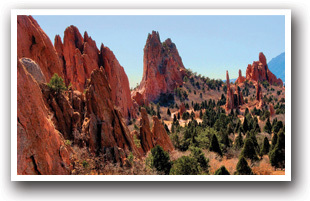 Natural wonders in the area include Cave of the Winds, a natural cave system that offers everything from easy walking tours to muddy, spelunking adventures, and Garden of the Gods Recreation Area, an area filled with breathtaking natural red rock formations and beautiful hiking opportunities. Closer to town, vacationers can stop by Old Colorado City, the original site of Colorado Springs and a registered National Historic District, to catch a glimpse of restored 1800s architecture, sample fine dining, and explore local shops. Stop in for homemade ice cream at the Colorado City Creamery. Historic Manitou Springs offers leisurely strolls through town to sample its namesake natural spring water at the drinking fountains. 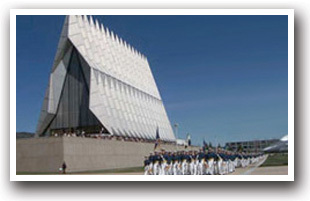 Head to Colorado Springs' north side for a tour of the United States Air Force Academy. Sports fans can catch a baseball game at Security Service Field, where the Sky Sox - a triple-A affiliation club for the Milwaukee Brewers - play all summer long. There are some great Jeep & ATV Trails west of Monument connecting to Woodland Park. 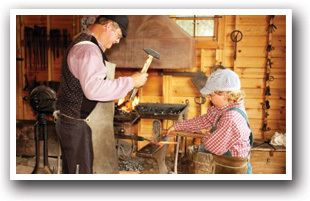 Explore the Pike National Forest and get an overview of the whole Colorado Springs Metro area. There is wildlife watching opportunities around Colorado Springs. Make it easy on yourself by visiting the Cheyenne Mountain Zoo or spend the day at Cheyenne Mountain State Park and take a naturalist led hike. And though its unlikely any vacationer could run out of things to do in Colorado Springs, the surrounding area offers even more fun things to do, from hiking and fishing to gambling and theme parks. Calhan is home to a unique geological wonder; located 35 miles northeast of Colorado Springs, there are 4 miles of trails to explore the brightly colored clay formations with plenty of photo opportunities in the Painted Mines Interpretive Park. Fountain is home to the Pikes Peak International Raceway, known as the "fastest 1-mile paved oval anywhere." Many NASCAR and Indy Racing Leagues use the track for racing, practice, and training. It also is home to Metcalfe Park, which has picnic areas and a skateboard park. Colorado Springs is 142 miles north of the Colorado-New Mexico border along Interstate-25 and 155 miles west of the Colorado-Kansas border along Highway 94 and Highway 40. Monument is 20 miles north of Colorado Springs along I-25, Black Forest is 19 miles northeast of Colorado Springs, and Fountain is 14 miles south of Colorado Springs along I-25. Commercial air travel accommodations are handled by the Colorado Springs Airport . Please contact your preferred travel agent or airline for flight arrangements. 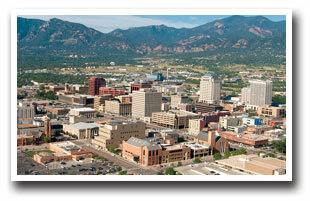 Colorado Springs Metro is near: Pikes Peak Area & Royal Gorge Area.